I can never thank enough the Democratic voters of New York's 14th congressional district for giving us Alexandria Ocasio-Cortez, the young Latina who stunned politicos by beating powerful Democrat Joe Crowley in the primary. Ocasio-Cortez's win was greeted with enthusiasm by the Bernie Sanders wing of the Democratic Party, who hailed her as a rising star and a champion for democratic socialism. But since then Ocasio-Cortez has been a gaffe-generating gift to her opponents. First she completely whiffed on a question about Israel in an interview with PBS, even straight up admitting "I am not the expert on geopolitics on this issue." She earned a "Pants on Fire" rating from Politifact for the same interview, when she claimed that unemployment was down because people were working multiple jobs. In her next interview she completely flip-flopped on her response on the Israel question to please the left. She responded to the critics of the first interview by accusing them of being members of the alt-right (they weren't) and angrily accused her former primary opponent Crowley of secretly trying to mount a third-party run (he wasn't). This was in a span of three days. So yeah, conservatives are looooving this whole Ocasio-Cortez phenomenon. I for one couldn't wait to tune into her Wednesday night interview with CNN's Chris Cuomo, and she did not disappoint. To begin with, there was this word-salad two minutes into the interview. CUOMO: …If you win and you go to Congress, there will be a leader of your caucus, her name is Nancy Pelosi. Do you recognize her as the leader for the House Democrats? OCASIO-CORTEZ: She is, she is the leader of, of– no no, she, I mean, um, um, Speaker, or rather Leader Pelosi, hopefully, um, you know, we’ll see, she’s uh, she’s the current leader of the party and I think the party absolutely does have its leadership in the House, we our leadership in the Senate as well. Yikes. Even if it were coherently stated, it's obvious that Ocasio-Cortez was dodging the intended question. Cuomo wasn't asking whether she recognizes the fact that Nancy Pelosi is currently the leader of the House Democrats; this wasn't quiz bowl. He wanted to know if she would back Pelosi as leader if elected, and when Cuomo followed up and explicitly asked her that question, Ocasio-Cortez dodged again. The thing that we need to realize is people talk about the sticker shock of medicare for all. They do not talk about the sticker shock of the cost of our existing system. You know in a Koch Brothers-funded study–if any study’s going to try to be a little bit slanted, it would be one funded by the Koch brothers–it shows that Medicare for all is actually much more–is actually much cheaper than the current system that we pay right now. The Washington Post Fact-Checker gave this claim Three Pinocchios recently. The Mercatus study only "found" that Medicare-for-All would be cheaper than the current system because the author Charles Blahous was exceedingly generous to claims from Bernie Sanders and others that it would lead to huge savings in administrative costs. The point of the study was to prove that even if those savings emerged, the pricetag for Medicare-for-all would be enormous and still require substantial tax increases. In other words, the study "found" that Medicare-for-all would save money compared to the current system in the long-run because the author charitably took it for granted that it would. 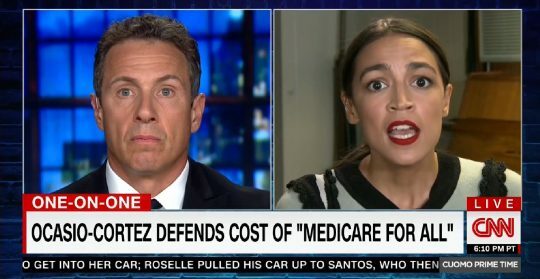 "It is likely that the actual cost of [Medicare-for-all] would be substantially greater than these estimates, which assume significant administrative and drug cost savings under the plan, and also assume that healthcare providers operating under[Medicare-for-all] will be reimbursed at rates more than 40 percent lower than those currently paid by private health insurance," Blahous wrote. And let’s not forget that the reason that the Supreme Court upheld the Affordable Care Act is because they ruled that each of these monthly payments that everyday Americans make is a tax. And so while it may not seem like we pay that tax on April 15th, we pay it every single month, or we do pay it tax season if we don't buy, you know, these plans off of the exchange. This is just wrong. The Supreme Court ruled that the individual mandate in the Affordable Care Act was constitutional because the penalty for those who didn't get healthcare was effectively a tax. Whether normal monthly premiums were a "tax" in a philosophical sense did not factor into their analysis in the slightest. Americans have the sticker shock of healthcare as it is, and what we’re also not talking about is why aren’t we incorporating the cost of all the funeral expenses of those who died because they can’t afford access to healthcare? That is part of the cost of our system. I can't believe I have to spell this out, but funeral costs are usually discounted when discussing healthcare costs because they're baked in no matter what. Pete could receive excellent healthcare and live to 100 or poor healthcare and die at 20, but either way at some point someone's paying for Pete's coffin, a plot of land, and some bagpipes. There are no long-term savings to be found in funeral costs no matter what the healthcare system. Even if Medicare-for-all miraculously raised life expectancy in the U.S. by a year, that would only defer funeral costs on average by a year. Unless commentators were being literal when they called Ocasio-Cortez the Democratic messiah, the funeral costs of every living American cannot be eliminated or diminished, merely briefly postponed. We write unlimited blank checks for war. We just wrote a $2 trillion check for that tax cut, the GOP tax cut. And nobody asked those folks how are they going to pay for it. This isn't wrong so much as it completely obfuscates the scale of difference between the price-tag on Ocasio-Cortez's proposal and the GOP tax bill and military spending. The higher estimates find GOP tax bill is expected to cost $2.3 trillion over ten years. Ocasio's plan is estimated to cost more than that annually, or $32.6 trillion over the same timespan. Likewise, the Congressional Research Service found in 2014 that the wars in Afghanistan and Iraq had cost $1.6 trillion over 13 years. We could wage thirty times as many wars and only start to get close to the sort of cash required for Medicare-for-all. No doubt Ocasio-Cortez would respond to these points by accusing me of trying to cover up some GOP sin. After another factually-challenged interview with the sympathetic Pod Save America podcast (in which she also failed to answer how she would pay for Medicare-for-all) and after most of her endorsed candidates lost their primary races, Ocasio-Cortez accused conservatives of trying to distract from the recent indictment of Republican Congressman Chris Collins. The interview, the elections, and the resultant criticism were on Monday and Tuesday. Collins was indicted on Wednesday. Yes friends, even the flow of time manages to escape Ocasio-Cortez. This entry was posted in Politics and tagged Alexandria Ocasio-Cortez, Chris Cuomo, CNN. Bookmark the permalink.